Termites cost U.S. home and property owners an estimated $6 billion a year by destroying crops and wooden structures. This damage is a result of their consumption of cellulose, an organic compound found in plant matter. If termites target a home as a food source, they can cause extensive damage to the building’s wooden components. An average-sized termite colony can destroy more than a cubic foot of wood per year. Our inspectors are trained and experienced in completing inspections for VA and FHA home loans to make your home buying process as efficient and friendly as possible. 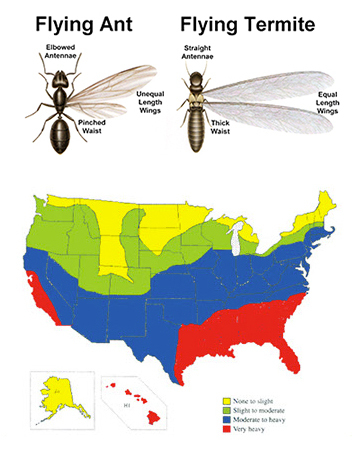 If you are buying a home and need a termite real estate inspection or you already own your piece of the American pie keeping it termite free should be a priority. One of the most elusive insects we deal with, the Eastern Subterranean termite can be monitored for control or treated with soil injection for warrantied protection through Yankee Pest Controls Healthy Home Premium protections plans. to schedule your termite inspection and allow our staff to keep your home pest free.